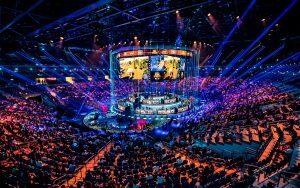 The Mercedes Benz Arena in Berlin was transformed into a giant live e-sports battle environment for the PUBG Global Invitational 2018, the first major international live tournament organized by the PUBG Corporation, and the first world championship in competitive PUBG. Twenty outstanding 4-person teams competed for a share of some serious prize-money over four days. To add some real theatre to the hi-octane first-person shooting action and kick everything off to a dramatic knife-edge start there was also an energy-fuelled opening show. 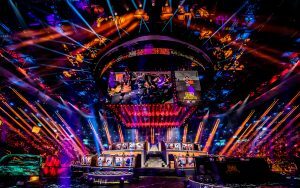 Event producers Production Associates asked visual specialists Live Legends to create a high-impact lighting design for the Opening Show and the championship, for which around 600 Robe moving lights played a central role. Between the start of the project and getting to site in Berlin, Live Legends’ initial brief for the lighting design was also considerably expanded to include lighting control, set design, video content and control and full creative direction for the opening spectacular. The Live Legends team on site was led by Jeffrey Goes. They have previously worked with Production Associates on Xbox and FIFA events. Their challenge was to create a fully 360-degree visual environment – with the stage in the centre of the room – that connected the audience with the gamers and all the on-screen thrills-and-spills … and this had to look fantastic on camera for live streaming and recording. For the Opening Show, Jeffrey and the team utilised 48 x 30K projectors which were mapped cross the set, the arena floor and a massive 20-metre-high cylinder shape made up of scrim attached to a 30-metre diameter circle truss centre stage. Highly detailed graphics from the game were projected and integral to setting the scene, taking the audience right inside the world of PUBG, complete with 16 violinists and a swoop of ‘paratroopers’ (aerial artists) who dropped in from the roof, SWAT-style, as if they were playing the game … all exhilarating stuff together with some hair-raising special FX! 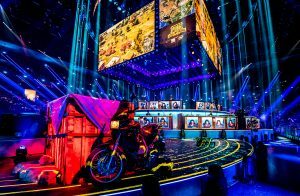 In translating specific PUBG content for the live game sessions, Live Legends’ design utilised various prevalent shapes for both the set and the lighting effects. They looked for nice groupings of lighting to give powerful but clean looks – a task harder that it might seem with around 1500 fixtures in total on the rig! The PUBG game comprised five phases in which the playing ‘grounds’ were reduced the higher the players progressed, and the terrain also became edged by dangerous electrical fields … so lighting effects were ideal to accentuate these shrinking spaces, and for emulating the electrical fields. In the roof, several curved and circular trusses were installed. 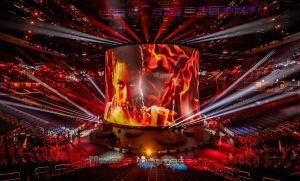 The centrepiece featured a 30-metre diameter scenic element at the top and that same truss also provided flying facilities for a series of LED screens hanging below, covering a 360-degree viewing angle around the room – allowing all the audience to enjoy the games action close-up. 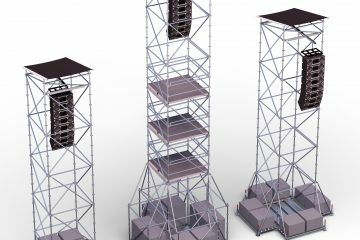 The 252 x LEDBeam 150s were used inside the centrepiece to create a giant lightbox around the underside of the LED screens. Their beams made great eye-candy for the back-of-camera shots, and they could also shoot down and illuminate performers perfectly. The small size of the fixtures made them ideal for the rigging location inside the trussing ring. The 124 x LEDWash 800s were deployed between the 360-degree LED screens, utilised to create an array of attractive colour washes and colour effects for some of the crucial show moments like the Awards ceremony. The 50 x BMFL Blades were also rigged in the centrepiece, used both as a powerful effects lighting with searing beams, as well as to create special front lighting positions “thanks to their great multifunctionality” explains Jeffrey. The 176 x MegaPointes were used to trace the outlines of the concentric circles and curves of the floor set pieces, and for creating multiple circles within the actual team playing booths ”The MegaPointes’ wide functionality and extreme power were a perfect solution” stated Jeffrey. Jeffrey and the team specify Robe frequently in their work. They like Robe for the range of luminaires. “the diversity, the functionality and the fantastic colours and optics”. 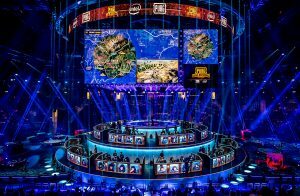 The overall brief for this project was to turn the PUBG games into a dynamic live experience and help feed the energy around the arena to some incredibly animated audiences … so lighting was essential for translating and accenting certain events in the game – like the decreasing playing circles mentioned above. When anyone died in the game – the video content of the playing teams’ booth changed immediately. This realtime video content generation – Game Trigger Scripting – is written by Live Legends’ code wizard Dave van Roon. In an event of many challenges, one of the main ones was working with so many different nationalities in the teams, and this is where the Live Legends’ expertise really came into play! In Asia, Jeffrey explains, the broadcasters like to see brighter and lighter skin tones … whereas in Europe and the USA, they prefer more tinted skin colours. 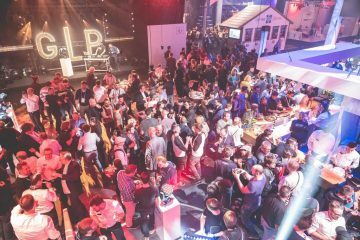 With the event streamed world-wide … meeting everyone’s detailed requirements was an exacting task on the lighting side. Apart from that, running a rig of 1500 lights in a venue is always a challenge! But of course, … that is where Live Legends excel! Jeffrey worked closely alongside his Live Legends colleagues Serge Patist (set design / production manager), Jim de Brouwer (visual effects specialist) and the company’s creative director Ad de Haan, among others, on this demanding project. 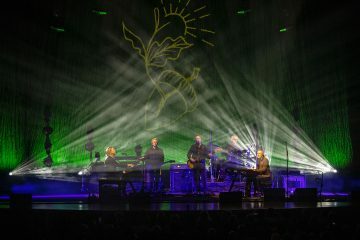 All lighting and video was supplied by PRG Germany. Hotly tipped and highly rated Chinese team OMG (Oh My God) nailed first place in the tournament after several consistent show-stopping and blistering performances from day one! Don’t get in their way!